There are two things that signal the coming of the Seattle Spring – the blossoming of the cherry trees in the UW Quad and all the buzz surrounding March Madness and the NCAA Men’s Basketball Tournament. While picking the bracket is an exercise in futility for many of us – it’s the participation that counts – one can’t help getting caught up in the excitement around 65 basketball games in 20 days. Last year was the first time every game was televised nationally, which led to a huge boost in ad spending, bringing in $738 million, according to Kantar Media. The average cost of a 30-second ad in last year’s men’s championship game was just over $1.24 million. For those buying TV, the games are particularly attractive because they reach a coveted young male demographic in real time, that is, not tape-delayed as most young adult viewing is these days. Only the Super Bowl surpasses the men’s basketball tournament in total ad revenue generated. As the number-one advertiser, General Motors devotes a significant chunk of change to the tourney – AT&T, Coca-Cola, Anheuser-Busch and Capital One Financial rounded out the top 5 in 2011 – which includes sponsorship arrangements with the NCAA. 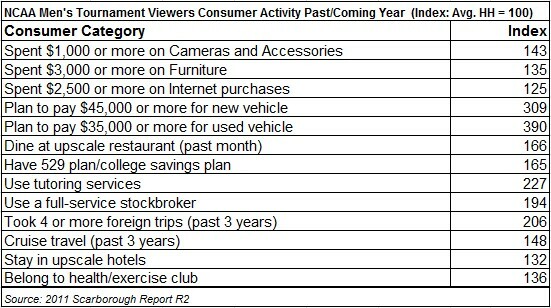 Right behind the Automotive category for most spend is Insurance, surpassing the Restaurant category last year. Other prominent categories include energy drinks, airlines and sports-apparel makers. The expected young male skew of college sports along with the relative affluence of the audience is a good fit for all three of these categories. Or is it? 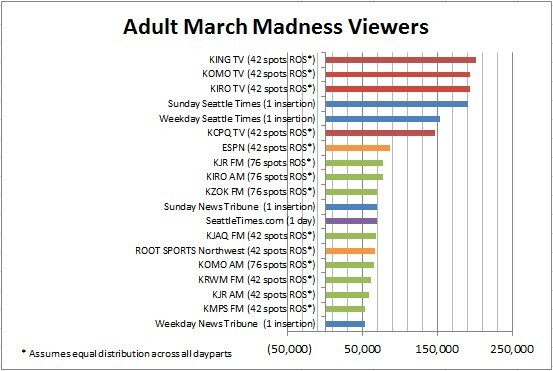 In Seattle, more than 591,000 tune into the tournament on broadcast or cable TV at least for a few minutes of a game. It definitely skews male, at 73%, but not as young as advertisers are hoping. The biggest draw is Boomers (ages 45-64) at 43%, followed by Gen-Xers (27%), then Matures (16%). The advertiser target demographic of Millennials (ages 18-29) makes up just 14% of the viewers. There’s no doubt the Big Dance attracts the most affluent of viewers. Being college games, it should be no surprise that six in 10 are college-graduates with nearly half employed in executive, management or professional occupations. They are 20% more likely to be self-employed and at 26% composition of viewers, are 69% more likely than the general population to be small-business owners (Office-supply firms take note!). It’s no wonder auto makers are deeply committed to the tournament. Nearly four in 10 NCAA Tournament viewers in Seattle say they are in the market for a new vehicle and more than half are shopping the used vehicle market, likely for the new drivers emerging in their households. Not only are they planning to buy, but they are three times more likely than the general public to spend $45,000 or more on that new car and $35,000 or more for a used one. Speaking of new teen drivers, Big Dance viewers are 127% more likely than the general population to use tutoring services and to make sure that investment comes to fruition, they are 65% more likely to have already invested in a 529 or college-savings plan. Given their high discretionary income, they are nearly twice as likely to use full-service stockbrokers to help manage their money. Travel (beyond airlines) is another advertising category that should be speaking more to these viewers. They are twice as likely to have taken a four or more foreign trips in the past three years for business or pleasure, or both. They are 48% more likely to go on cruises and 32% more likely to stay at upscale hotels. Upscale restaurants also hold a particular affinity for with this target; they are 66% more likely to have dined at one in the past month than is the general public. March Madness fans are as engaged with their communities as they are with the game and far outpace the general market in their donations of time and money to a wide spectrum of causes, including political. It is noteworthy that this target is split almost evenly between Democrats and Republicans in this typically blue state; in fact, like college sports loyalties, there seems to be little middle ground as March Madness fans are under-represented among Independent voters. Even with the 50/50 split in total numbers, they are 33% more likely to be Republican and 25% more likely to consider themselves Independent, leaning Republican than is true for the general market. These game viewers lead exceptionally healthy lifestyles. They are 36% more likely to belong to a health/exercise club and considerably more likely to be runners and play in a wide variety of participation sports. While they are exceptionally active, the demands of a professional life take a toll on them; nearly one in five has been treated for cardiac ailments. They also are 38% more likely to end up in an Orthopedic surgeon’s office. And vanity has not escaped them; they account for nearly 40% of the adults who have had teeth whitened or have had other cosmetic dental work done, and are more than twice as likely to have done so. Pampering is another favorite pastime; they are 22% more likely to be found at a day spa and 21% more likely to have their own spa, hot tub or pool at home. When the occasion calls for it, they are 51% more likely to frequent a florist (non-grocery) and 35% more likely to visit a fine jeweler. When they aren’t on the golf course or playing on a recreational team, they consume a lot of content online and on their mobile devices. Not surprisingly, fantasy sports and sports scores and updates rank high for these March Madness devotees. But they are general information consumers as well, accessing both national and local news online sites and seeking automotive and financial information through targeted sites. They are tech-savvy and are well invested in mobile, tablet and eReader technology. They are avid online shoppers and buyers and are 25% more likely to spend $2,500 or more online annually than is true for the general market. In addition to Television and Internet usage, driven by an insatiable appetite for sports, March Madness fans access nearly all media equally and more often than the general public. It’s no surprise that all that outdoor activity exposes them to more out-of-home advertising messaging as well. Their Television, Out-of-Home and Internet consumption is matched by their use of all other major media sources, with the exception of Social Media and Direct Mail, in which they are only average users and responders. 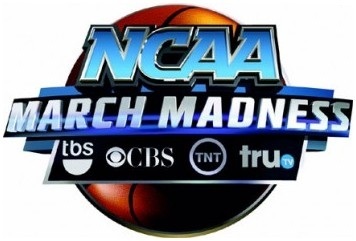 While March Madness local TV buys are priced out of most local advertiser’s budgets, if they are even available, our target’s high media consumption offers plenty of local options that tap into this highly desirable demographic 365 days a year. For small-budget advertisers, consider sports team sponsorships and in-store themed contests, golf-bench advertising, sports-bar promotions, local news sports recaps — I’m sure you can think of many more. 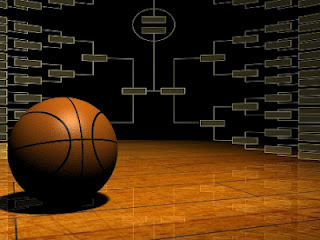 Whether or not they win or lose on the court, retailers and organizers who tap into the Madness and the game’s local audiences — through the media they consume and via the activities that fill their time the remaining 345 days a year — will find themselves the #1 seed in the bracket before you can say double-dribble! Let the games begin! 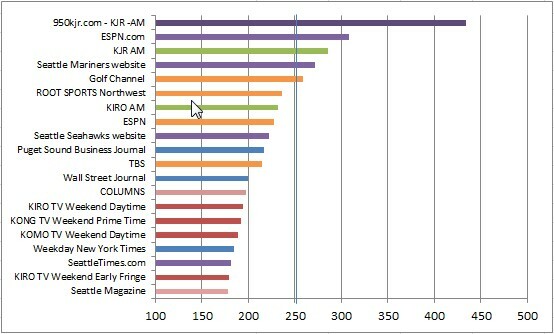 Need help navigating media for a Seattle target audience? Drop me a note and I’ll take a look at it, no strings attached. Simply email seattlemediamaven@seattletimes.com or describe your audience in the comments below.